By studying the genome of a kind of octopus not known for its friendliness toward its peers, then testing its behavioral reaction to a popular mood-altering drug called MDMA or "ecstasy," scientists say they have found preliminary evidence of an evolutionary link between the social behaviors of the sea creature and humans, species separated by 500 million years on the evolutionary tree. "The brains of octopuses are more similar to those of snails than humans, but our studies add to evidence that they can exhibit some of the same behaviors that we can," says Gül Dölen, M.D., Ph.D., assistant professor of neuroscience at the Johns Hopkins University School of Medicine and the lead investigator conducting the experiments. "What our studies suggest is that certain brain chemicals, or neurotransmitters, that send signals between neurons required for these social behaviors are evolutionarily conserved." Octopuses, says Dölen, are well-known to be clever creatures. They can trick prey to come into their clutches, and Dölen says there is some evidence they also learn by observation and have episodic memory. The gelatinous invertebrates (animals without backbones) are further notorious for escaping from their tank, eating other animals' food, eluding caretakers and sneaking around. 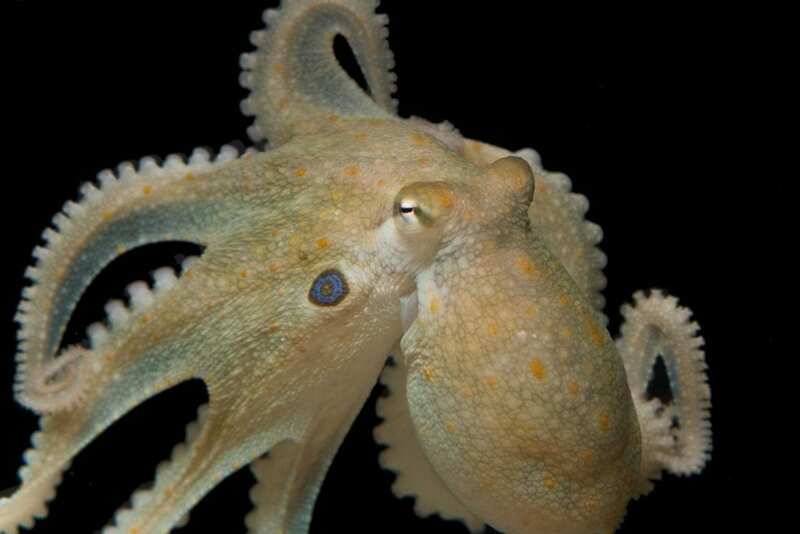 Specifically, in the gene regions that control how neurons hook neurotransmitters to their membrane, Dölen and Edsinger found that octopuses and humans had nearly identical genomic codes for the transporter that binds the neurotransmitter serotonin to the neuron's membrane. Serotonin is a well-known regulator of mood and closely linked to certain kinds of depression. "It's not just quantitatively more time, but qualitative. They tended to hug the cage and put their mouth parts on the cage," says Dölen. "This is very similar to how humans react to MDMA; they touch each other frequently." Dölen says the experiments suggest that the brain circuits guiding social behavior in octopuses are present in normal conditions, but may be suppressed by natural or other circumstances. "Octopuses will suspend their antisocial behavior for mating, for example. Then, when they are done mating, they go into aggressive, asocial mode," says Dolen.